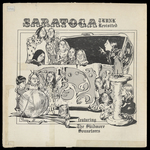 Skidmore College, "Saratoga Trunk Revisited, Featuring The Skidmore Sonneteers (1974)" (1974). Sonneteers Albums. Album 10.